In Asia it is not uncommon to eat fruit with salt or even soy sauce. From my own experience, and via friends, I known that fruits such as mango, guava, honey dew melon, watermelon, nashi pears and papaya are eaten with salt. 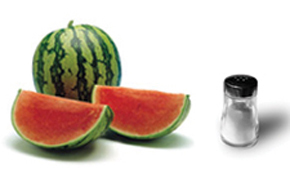 Interestingly salt is used both for ripe and unripe fruit – the latter is especially the case for mango and guava. With unripe fruit I can imagine that the primary motivation is reduction of bitterness. I’ve previously blogged about salt and coffee and how salt in tonic water reduces bitterness – the mechanisms are the same. In addition to the bitterness suppression low concentrations of salt will enhance sweet taste. This would certainly be an advantage in unripe fruit. In ripe fruit there is hardly any bitterness left (or at least I presume that is the case), so here the salt may serve a different funtion. Could it be to balance the sweet taste and give a more savory and complex flavor? Perhaps it could also be explained as increased sensing by contrast amplification? Nashi pears (Asian pears) are delicious when served in a bowl of salty water! 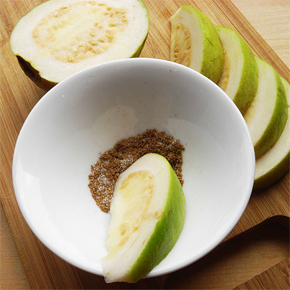 One particular combination of fruit and salt that I remember from growing up in Taiwan is eating slightly unripe guavas with a beige powder. We would either sprinkle the powder onto the fruit or simply lick it from our hand. The powder had a savory flavor and was a little salty. I can’t remember the name, but from a couple of google searches I’m quite sure that it was a dried plum powder – li hing mui (or just li hing). I see that it’s available from several sellers on Amazon (In fact I just ordered a pack from Hawaii – if it’s the same I used to eat with guavas as a child it will bring back a lot of memories when it arrives!). I found a couple of blogs showing guava with plum powder and masala salt which suggests that there are probably several spice powders used together with guava. The Wikipedia entry on guavas also mentions them being eaten with soy sauce and vinegar (occasionally with sugar and black pepper) on Hawaii, and with a pinch of salt and cayenne powder/masala in Pakistan and India. 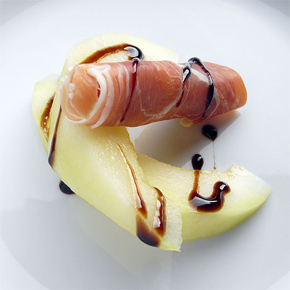 Guavas taste even better with a salty/savory dip! For the picture I combined ground star anis with salt and sugar. chili salt with fruits such as Granny Smith apples, plums or oranges. It seems that eating fruit with salt is far more common in warm countries where an additional intake of salt is recommended due to perspiration. And I admit that my craving for salt does increase when it’s warm. But there is more to this than physiology – the few combinations I have tried are indeed mouth watering – even when tested in cold Norway. 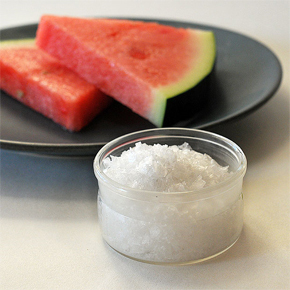 And thinking about it, it is really fascinating how plain table salt – one of the simplest (chemically speaking) ingredients we have in the kitchen – has such a repertoire in combination with fruit. There is certainly a lot to try out in the kitchen now – and perhaps some inspiration from Asia for chefs as well? Next post: Guanabana – The delicious, healthy, weird looking fruit.